David Willey gave another pulsating demonstration of the talent which has won him international recognition when his second century of the season kept Northants in the LV County Championship Division Two match against Derbyshire at the 3aaa County Ground. The 25-year-old, who made his full England debut in Dublin last week, launched a counter-attack with Josh Cobb that lifted Northants from 101 for 6 to 324, only 19 behind Derbyshire who closed day two on 76 without loss , a lead of 95. The home side looked set for a much bigger advantage until Cobb (95 from 112 balls) and Willey with a run a ball 103 plundered 163 from 29 overs, a Northants seventh wicket record against Derbyshire, with the visitors scoring 202 between lunch and tea. In many ways the day mirrored the first with wickets tumbling before the batsmen dominated in the afternoon sunshine although the Northants revival was in marked contrast to Derbyshire’s recovery. No one could have predicted the batting storm that broke after lunch when the Northants top order crumbled in the morning against disciplined seam bowling. With skipper Alex Wakely unable to bat because of the hand he injured when dropping Matt Critchley on day one, it looked bleak for Northants when Rob Keogh became Tom Taylor’s third victim 93 short of the 194 follow-on target. But Derbyshire’s attack wilted in the face of Cobb and Willey’s thrilling charge with both batsmen targeting Critchley’s leg-spin as the 18-year-old tasted the other side of the game following his record-breaking century on Sunday. His first five overs went for 45 with 21 coming from one over when Willey drove and pulled him for two of his five sixes but just like Wakely’s miss, Critchley’s failure to hold a return catch when Willey was on 19 proved costly as the seventh wicket pair trod hard on the accelerator. Cobb, who took a ringing blow on the side of the helmet when he ducked into a short ball from Mark Footitt, looked certain to celebrate his first century for Northants until he chased a wide one from Shiv Thakor. Willey did not miss out and after facing 46 balls for his first 20 runs, he scored 80 off 50 to power to his second first-class hundred with a fusillade of searing drives and pulls. 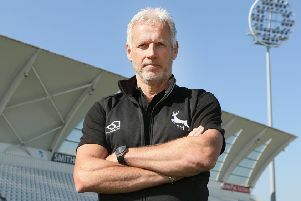 After he lifted Thakor into the hands of deep mid off, Ben Slater and Chesney Hughes played out the day in more sedate fashion to leave Derbyshire’s elite performance director Graeme Welch satisfied with his team’s position. Northants head coach David Ripley had encouraging news regarding Wakely and Cobb. “Alex has been for an x ray on his hand and it didn’t show a break so hopefully with another day of ice and rest we can use him on the last day.